Every so often there comes along a poet who chisels his words out of an unforgettable experience, a rare event in his life that left him forever changed. 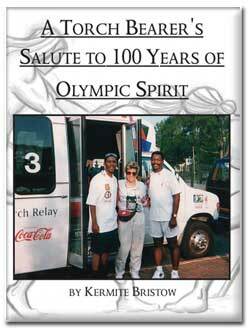 When Kermite Bristow, gifted in the expression of the beautiful, was chosen to be an Olympic torchbearer, he was inspired to create wonderful poetry now comprising his new book, A Torchbearer’s Salute to 100 Years of Olympic Spirit. This poetry anthology — perfectly worded, exquisitely realized — tells of true-life stories of Olympic heroes. Written in rhyme, it explores the Olympics down through the ages and the people involved. At the same time, it pays tribute to the men and women whose passion for and love of sport has kept the Olympic spirit alive. A mesmerizing poetical tapestry from cover to cover, A Torchbearer’s Salute to 100 Years of Olympic Spirit scores a golden triumph for one of the poetry genre’s most promising new talents.